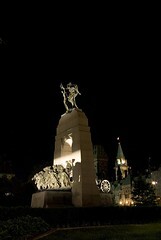 Well, i promised more thoughts on Remembrance Day, and now that my Road Trip to Ottawa is upon me, its time for it. 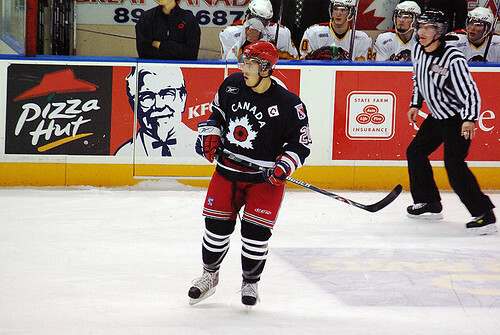 This trip is a double whammy, a weekend of Ontario Hockey League games in Kingston Friday night, Belleville Saturday night, and Ottawa Sunday afternoon as I follow my Kitchener Rangers on the road with friends. It also, for the 2nd straight year falls on the Remembrance Day weekend. Last year i was unable to make the trip, but this year, I am going, and the Rangers are bringing their "one time use" Remembrance Day charity Jerseys to the game in Ottawa on the 11th, a nice touch after they were used in the teams own ceremony last Friday and auctioned off, raising over $19,000 for Veterans Charities, and bringing the three year total raised to over $51,000. I wish i could have afforded to win one of the auctions, but the "game ready" jerseys of players who didn't dress went for a minimum of $500.00!!! Congratulations to the fans of the team and the people of Kitchener for going all out to support the cause. Now, on to Remembrance Day itself. For me, i have vivid memories of years of the Remembrance Day assemblies in elementary school, with actual Veterans coming in and speaking, and hearing about my own Great Grandfather Lt. West, Volunteering to join the British Army, and leaving the backwaters of Northern Ireland for the front lines of France and the "Western Front". My Great Grandfather would answer the call again in the Second World War, serving as a member of the home guard in england as he was "too old" for active service in Europe. When I was at university, a major part of my program for those who could go, was a course which involved a six week exchange at Oxford Brookes University in their planning department. The benefit of this, was free time to travel outside your classes. While my Great Grandfather fought for his homeland, my parents emigrated to Canada before I was born, and my identification, while with my Great Grandfather's personal involvement, is with my country, and the soldiers who fought for it. Growing up hearing of Vimy Ridge, John McRea & In Flanders Fields, Dieppe, Juno Beach I identify with the Canadian experience of the World Wars much more so than the British. Accordingly, the top priority for me was a visit to the Vimy Memorial, a place that has come to symbolize the moment where Canada became more than a colony, but a country, with strength and abilities all her own. 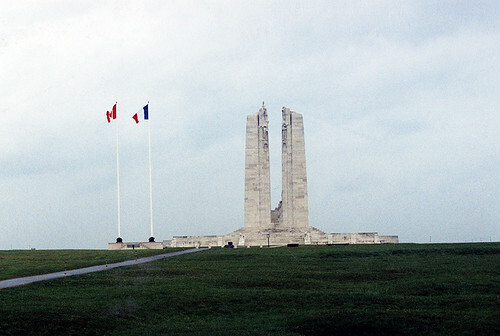 While there is much debate about the "Myth of Vimy", it is important to recognize that whatever the actual facts are, it has become something more, a touchstone of our Identity, and in that role, it can promote continued education about our history and role in the world, then it is important. For Sunday's ceremony, i intend to be at the National Cenotaph in Ottawa to applaud our veterans during the parade, as my way of saying thank-you for risking your lives in the defence of freedom, of losing your youth and so many friends in the name of the cause. Each year there are fewer and fewer veterans with us, 2007 has seen the number of Canadian Army veterans from the First World War reduced from three to one, a single veteran, John Babcok once a young man from Ontario, one of over 600,000 such young men who went to France, now a gentleman of 107 years, links us to those times. Time never ceases to move forward, and we can not allow the passing of time to diminish the meaning of their service and sacrifices. As time passes, we will experience the same loss with Veterans of the Second World War, then the Korean war, and someday long after our times, the veterans of the current Middle East Conflicts, but if we do not learn from what has come before, will we not just continue to make the same mistakes, leading to more death and sacrifice? I urge anyone who reads this to take the time on the 11th to reflect, attend your local ceremony if you can, contemplate why it is that humanity seems unable to break the chain of violence that leads to war. We can all do better, we must all do better. I leave you with with some thoughts, please consider the importance of thanking Veterans when you see them out for the Legion's Poppy drive, I know that they appreciate a kind word as much as your donation. Also, put aside your political beliefs regarding the current role of the military in Afghanistan and think of the Soldiers themselves. It is not by their choice that they are there, they signed up to perform a role, that of soldier and defender of us, their political masters choose where they go, please make sure you understand the distinction between "Supporting the Troops" and "Supporting the War", I won't tell you which way to feel, because you must decide that for yourself, but I implore you to realize and understand that if you disagree with being in the middle east, you can still support the troops, and hope and pray that they are allowed to do what they have been ordered to do, and come home alive, because no families in the 21st century should have to suffer the pain of losing loved ones to war, that is something that as a planet we need to consign to the pages of history books.